Tonight we are going to review a single varietal feteasca neagra wine, which is an indigenous romanian variety with moldovan origins – Feteasca Neagra 2014 by Vinaria Nobila. 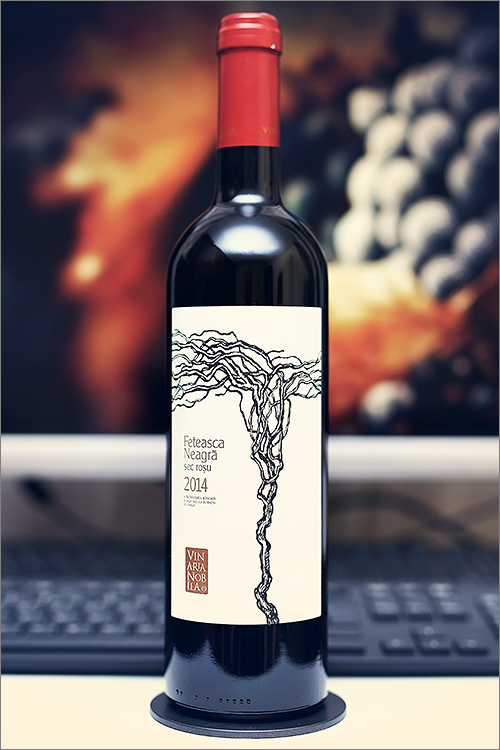 This is the successor of the famous Feteasca Neagra 2013 wine and it has been oak aged for 24 months. Feteasca Neagra is the most famous grape variety in Romania, one that has not been yet explored at its full potential in Moldova. It can produce quite bold and complex red wines that can be compared to new world cabernet sauvignon, mostly due to their full body and elegant texture, thus resulting in quite distinctive wines, with a pronounced typicity and spiciness. That said, let’s move on to the tasting! Deep and noble ruby color, with bright copper shades towards the rim of the glass. The nose is strong, filled mostly with black fruits and spice: blackcurrant, ripe sour cherry, black mulberry, ripe blackberry, black cherry, black plum, black cherry jam and walnut jam. An instant later the nose is filled with notes of roasted oakwood, nutmeg, cinnamon, dried cherry, black tea, tobacco and some nuanced hints of charred wood. The wine is extra-dry, with high alcohol level, high acidity and ripe tannin. It feels bold, firm and muscular, with an extracted oaky and fruity accent. This is a quite expressive tannic and massive feteasca neagra wine, as it tastes bitter-seedy and quite austere. The wine has a fair overall balance, where the wood dominates over the fruit, with a touch of alcoholic warmth showing through on the mouthfeel. It has a long finish and a more or less balanced, bitter-seedy aftertaste. Conclusion: this is a wine in its prime form – bold, firm and muscular with a bit more angularity that expected, still a fine oaked feteasca neagra wine. We would suggest a couple more years of bottle ageing, so that the tannins and acidity will get enough time to settle down, as the potential is there. Despite its angularity, the wine has plenty of tannic grip on the palate and a dense, rich, and enormously concentrated palate, which is mixing power with finesse. Our recommendation is to pair this wine with spicy and bold meaty dishes, like for example a grilled venison steak or a spicy deer skillet steak, so that all the angularity in the wine will be tempered by the flavours of the meat. Enjoy!